Just made a plywood cutting table, also doubled as work table from some half-lap 2×4 and a pair of metal sawhorses. It only needs about 2 minutes to assemble or dis-assemble, and requires very little storage space. Table provides different kind of clamping options and work support. I also mounted MFT rail support brackets at each side of the longer 2×4 (picture #5), so that I can use track saw to cross cut as on the Festool MFT with my spare 1080 top. 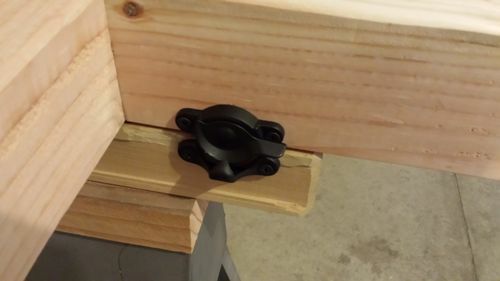 Window latches were used to lock the table top to sawhorses. Festool dominos were used as stops for window latches to work. Hope that helps to create some ideas. Thanks for looking. -- Mind is a terrible thing to waste or loose. 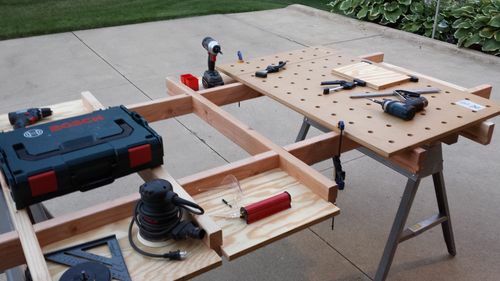 Very nice and handy cutting table!! Good idea. 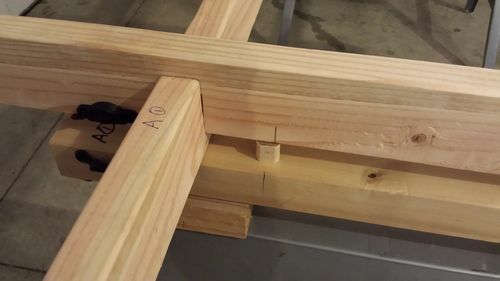 I made something similar for a portable thickness planer and miter saw stand. Been thinking about modifying mine for circular saw cutting of really wide/long boards. What you have here gives me more ideas. That looks great! Great thinking behind it too! I like the ideas. Love the Dominoe cutter! Can I borrow that? I can’t let the domino out of my shop! It’s too handy for the quick work. I like your Kapex set up too. Thanks.